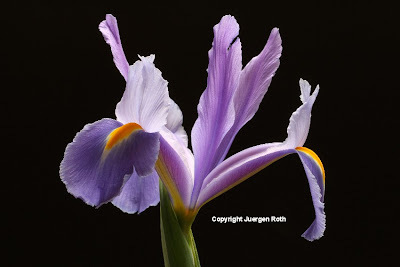 Every week I choose one of my favorite photographs of the week from my fine art landscape, flower and macro photography collection and offer it throughout that week at a discounted rate. 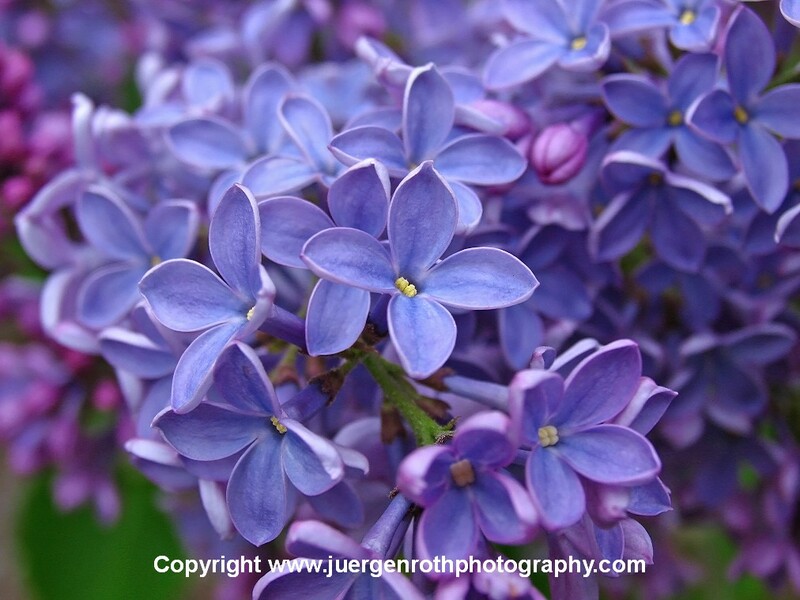 This week's photo of the week on sale is Glorious Lilac Bloom displaying flowering lavender lilac flowers in the Boston Arnold Arboretum. Learn more about my award winning photography and this floral image through my nature Photography Blog. 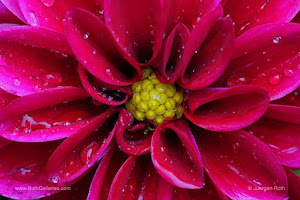 Starting today through the week of 27 February 2012 this Flower Photography image, available as art print, acrylic, or on canvas, is on sale. My last visit to Acadia National Park in Maine coincided with full moon. The day before I decided to take advantage and scouted for suitable locations along the granite coast shoreline next the park loop road. 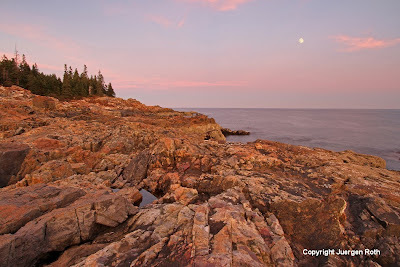 The next evening I made my way back to the promising location after a day of capturing the beauty of Acadia National Park. I set up tripod and camera near a tiny Tide Pool and patiently waited for the magic to unfold. It did not disappoint and I was rewarded with spectacular lighting enhanced by a beautiful moonrise across the Atlantic Ocean seascape. After shooting a few pictures in landscape format I decided to switch to portrait format. The portrait format in combination with a low camera point allowed me to include the moon and its reflection in the tide pool into the composition. 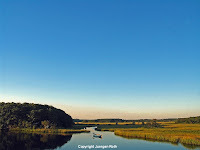 The Canon EF-S 10-22mm f/3.5-4.5 USM provided a sufficient wide-angle view that conveyed the spatial depth that I was looking for in my landscape photography image. I metered and manually focused on the granite coast in the foreground. A spit Neutral Density Filter reduced the light on the moon, sky, and soft layer of pink clouds while the foreground was exposed sufficiently. The aperture was set to f/5 providing a 10 second Exposure time that increased the silky water effect of the Atlantic Ocean and enhanced the moonlight reflection on the water. 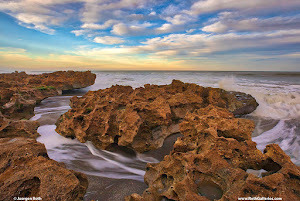 During post processing I removed dust spots, minimally adjusted lighting, contrast, and color saturation before sharpening the final Seascape Photography image. We went to see a Boston Celtics game the other Sunday and had a blast. Celtics came away with the win over the Chicago Bulls which made for an even better game. I was able to snap a few pics during the NBA basketball game ... Sport Photography and watching a game is such a thrill, isn't it? Wildlife Photos is always something I am after when I visit Florida and Everglade National Park. This Blue Heron photograph was taken in southwest Florida where the bird patiently was resting on a tree log at Turner River. The river is easily accessible from Turner River Road that follows the river; certainly one of the greatest Wildlife Photography locations in southwest Florida. The dirt road provides plenty of ample photography opportunities for the nature photographer and enthusiast. A 400+ mm telephoto lens provides sufficient reach for frame filling nature photography images from the comfort and safety of your car. 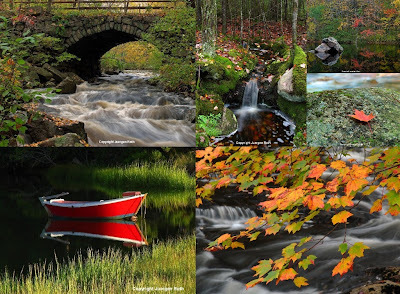 Besides your long lens you also want to bring a Polarizing Filter to minimize glare on the river water and boost colors of the wildlife and surrounding nature. In this particular photography image a larger aperture (small f-stop number such as 5.6 and less) minimized the depth of field as it is mostly suitable when photographing birds. In these types of photos we strive for a quiet backdrop that beautifully isolates the main subject from any distractions in the back and solely lays the focus on the main subject. 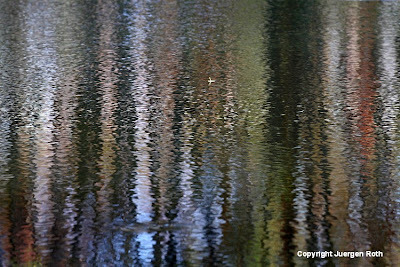 The long telephoto lens not only made the wildlife accessible but also generated a nice bokeh in the river highlights. The aperture was set to f/4 providing sufficient Depth of Field and in combination with an ISO100 setting resulted in an Exposure time of 1/30 seconds. In the post processing steps I removed dust spots, minimally adjusted brightness, contrast, and color saturation before sharpening the final image of the Blue Heron. Every week I choose one of my favorite photographs of the week from my fine art landscape, flower and macro photography collection and offer it throughout that week at a discounted rate. 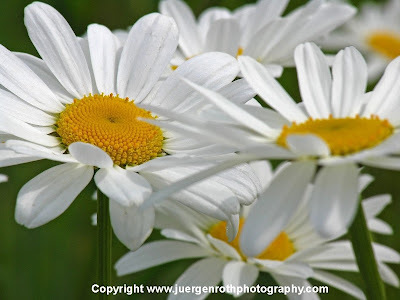 This week's photo of the week on sale is Ignorance is Bliss displaying flowering daisy flowers on Cape Cod. 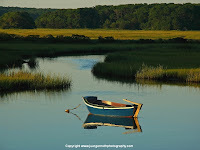 Curious about how I created photo and my trip to Cape Cod. 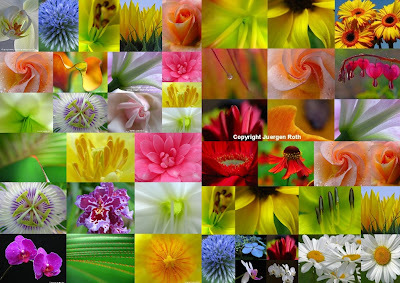 Starting today through the week of 13 February 2012 this Flower Photography Image, available as art print, acrylic, or on canvas, is on sale. 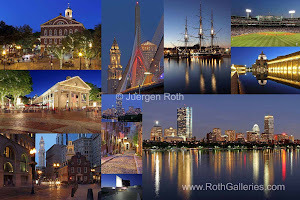 One of the first decisions we make as photographers when taking a picture is to shot in portrait or landscape format. 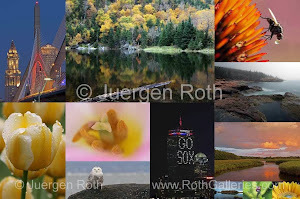 Portrait versus landscape depends much on the scene and photographic motif. 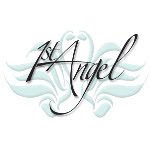 The right choice of format should add to an image, rather than detract from the picture. Most photographs are taken in landscape format. 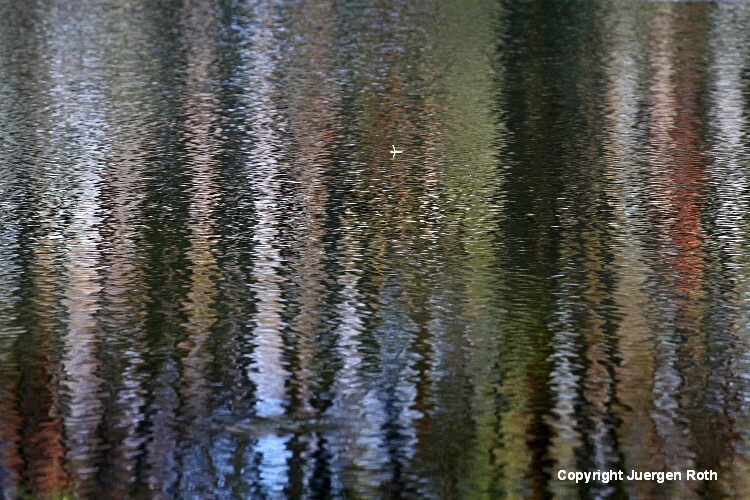 A horizontal picture usually appears calmer and allows the viewer to explore the motif and photograph, as the eye naturally wanders from left to right in accordance with the people's reading ability in the western hemisphere. The horizontal photo appeals more natural to the human eye, which comprehends wider easier than higher. The human eye is very much in-sync with landscape format since we are surrounded by day to day items that are rectangular shaped, e.g. movie, computer, touch pads or TV screens, cell phones, a microwave, even a simple car windshield we look through while commuting back and forth between home and work. Portrait format creates pictures that are often more interesting with a deeper spatial perspective. It is especially interesting in landscape photography where it often adds drama and provides a viewer with an unusual, different view. 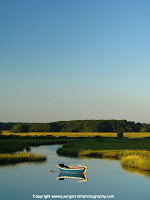 At first glimpse, the above motif of a blue Cape Cod dinghy seemed to be a perfect image for landscape format. So, I first went along in one of my early attempts where I laid the focus solely on the boat by a conscious decision of a 200mm lens and a high horizon placement. Not a bad picture but was it the best landscape photography image I could get away with that day? Luckily I did not think so and instead of packing up and moving on, I decided to follow my Photographic Instincts and explored different perspectives. I switched from the telephoto lens to a 28mmm wide-angle lens. The broader view with more spatial depth in the next image was accomplished by a low horizon placement. A small aperture (high f-stop setting) provided the required Depth of Field. The image itself I felt had a lot of distracting and unnecessary elements to the left and the right which is why I changed from landscape to portrait format in the final image. The format twist eliminated and distracting aspects from the composition, while the low horizon further enhanced the feel of spatial depth of the open, wide marsh landscape. The last 2 images clearly demonstrate what a format change from landscape to portrait is capable of doing for our Landscape Photography; it shows how photo details are added or eliminated by the switch. Next time you are out in the field do not forget the portrait format and consider once in a while a compositional format adjustment to hopefully enhance a picture. Lately I am photographing a lot of flowers in front of a black background. It almost has become an obsession and I am always on the lookout now for colorful flowers that really pop in front of the black when photographed with the right lighting. I position a large enough black cardboard behind the floral photographic object using a chair backrest for support. White cardboards are used to enhance the light and direct the light towards the floral when it is facing away from the window. I always use hardcover books making it easy to adjust the height of the flower when a different perspective or angle is more desirable. I often adjust the white boards to explore the impact on the lighting and better control the light on the flower. Adjusting the light with the white boards is a great learning experience for us photographers and often leads to more inspirational and beautiful photographs. In the final macro photograph of the yellow Gerber Daisies I positioned the flowers in the best possible way so that their petals did not overlap and a pleasant composition was achieved. The aperture of the Canon EF 100mm f/2.8 USM macro lens was set to f/18 providing sufficient Depth of Field and an exposure time of 2 seconds. An ISO100 setting minimized noise in the background and around the edges of the flower. 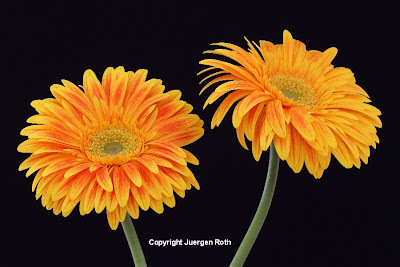 In the post processing steps I minimally adjusted brightness, contrast and color saturation before sharpening the image of the Gerbera.